Every Monday is Gareth's news day in school. It used to be a day he could choose a random thing to bring in and talk about. Generally a toy, frequently a McDonald's one which made us look like we never ate a home cooked meal at home. This term the news has become more structured. Last week they had to talk about a favourite recipe, this week bring in a poem about an animal or pet. 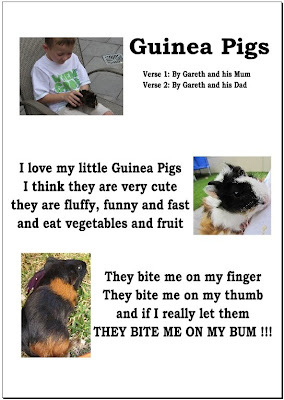 We searched our bookshelves, we googled "kids animal poems" We didn't find anything Gareth liked. I really enjoyed your comment on "Bring the Rain." I'm sorry for the loss of your baby. The ministry available from the Lord through Angie Smith is such a wonderful blessing. Many years ago, my dear my friends from Sidney, BC were on a teaching exchange in New South Wales. (Yes, that's spelled correctly.) I am blogless in the Seattle Washington area.